I've been always fascinated by the sheer grandeur of the Space and our Space Shuttles. Remember in the movie Armageddon, Rockhound says "You know we're sitting on four million pounds of fuel, one nuclear weapon and a thing that has 270,000 moving parts built by the lowest bidder. Makes you feel good, doesn't it". For quite sometime now, I've been trying to figure out the power of a Space Shuttle Main Firing Engine (analogous to counting the power of the Sun itself!!!). So, I finally found it, and believe me I got two black eyes just by looking at the figures that came infront of me!! 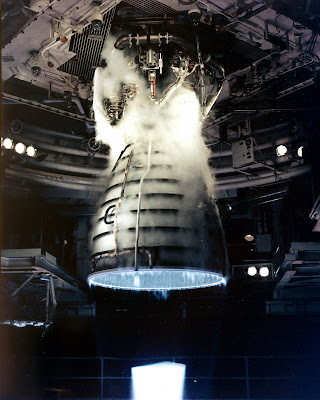 A unit of three, the Space Shuttle Main Engines (SSMEs) were constructed by Pratt and Whitney's Rocketdyne. The fuel for the monster are liquid Hydrogen and liquid Oxygen from the Space Shuttle's external tank, which are used during the ascent along with the two more powerful Solid Rocket Boosters. The main engines weigh around 3.2 Tonnes each and generate a blinding 1.8 MegaNewton power during lift off!! 1.8 MegaNewton stands roughly around 12 billion watts which is 16 million hp. To generate a power of 1hp you need a well tuned engine with a capacity of around 14-16cc. Playing safe and raising no question on the tuning of the shuttle engine, and again being modest in order save ourselves from getting breathless, if I consider the lower limit of 14cc, the cubic capacity of a Space Shuttle Engine would stand somewhere around 16 million hp x 14 cc = 224 million cc!! Now you must have imagined, why did I get the black eyes!!! !